Greece released a 5-stamp set on 16th March named Science and Art Through the Microscope. The stamps feature mind-blowing shapes and imagery of human cells as seen through a microscope. Dr. Maria Lambropoulou is a pathologist and associate professor of histology-embryology at the Democritus University of Thrace Medical School who captured these beautiful images. 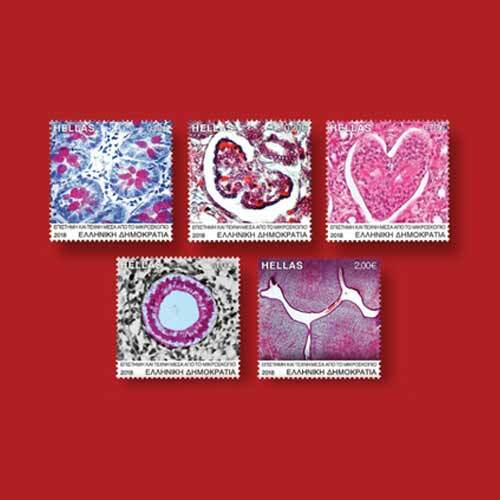 Hellenic Post officials said that Pathologists work dedicatedly to diagnose and treat diseases by studying human tissue. On most occasions, their jobs can be very boring but they also get a chance to view some spectacular images of cells that are formed unintentionally. The 10¢ stamp depicts a microscopic image that looks like flowers; the 20¢ stamp shows images of a cell that looks like a butterfly; the 72¢ stamp image resembles a heart, The 1 stamp shows a wreath formation while the 2 stamp depicts a beautiful deer formation. There is no information about the cells that were examined under the microscope to attain these images. Some reports suggest that the flower formation is captured while photographing intestinal glands under 200x magnification while the heart formation was captured while photographing a kidney section under the same magnification.